And it was actually using that much water, too. Heavy watering kept it alive for quite a while, but it never bloomed as much as it did when we first got it, until I started feeding it. First I was feeding at half-strength, every month or so. And what I noticed was that it started blooming about every month or so. So then I started feeding at every watering, again in half-strength, and then it bloomed all the time. So then I started watering at full-strength with every watering, and – it kinda stopped, actually. I think the issue is that I did this at the same time that we had a bunch of cold, gray days outside, and so it had the food but not the light. In any case, it's the only plant that I feed that often, or make a point of feeding at all, because it's the only one that responds when I do. Light is also important if you want it to bloom: ours here has gotten one of the coveted front-and-center spots in the only south window, because that's what it wanted and it tends to get what it wants. Often, buds will form all over the plant after a feeding and watering, but only the ones facing the window will develop and open, at least until the plant gets rotated. The rest of the care is not terribly hard. Full sun, lots of food and water, but temperature is not a big deal: according to one site, it's hardy outdoors to 28ºF, and can be grown outdoors in zone 9b, so I think we can assume that any indoor temperature should be fine. I've worried about the humidity from time to time, but it hasn't seemed to have any problems with that, even in the winters when it's dry in here. It will dump a bunch of leaves if the soil gets too dry, which are a pain to pick up, and the flowers wind up all over the floor all the time when the plant is happy (individual flowers last only two or three days), so it gets some difficulty points added for grooming. The leaves are dark green and naturally stay shiny. Growth is slow, but fairly consistent throughout the year. The flowers smell more or less identical to orange blossoms (my mother's comment recently was that "it smells like Texas," referring to the orange groves all over the lower Rio Grande Valley where we used to live, and she came up with this before I told her that the plants were related). I've gotten sufficiently accustomed to the smell that it's starting to just smell like "home" to me: unless there's been some kind of terrible incident, the Murraya is usually the first smell I notice when I come through the door, and it's in bloom often enough that there's an association built-up. It's nice to come home to. The first set of flowers we got turned into small (less than an inch long) reddish fruits after the petals fell off; most of the flowers in subsequent batches, and all the flowers for at least the last nine months, have failed to fruit and I'm not sure why. I kept some of the early fruits, thinking that seeds could be planted and all that, but they went moldy almost immediately so I pitched them. It turns out, after some investigation, that moldy fruit may still contain viable seeds, but the plant hasn't given me another chance in a very long time, so unless and until it decides I've learned my lesson, that information is kinda useless to me. Everything I've read about propagation suggests that cuttings are not easily done and have a high failure rate, but seeds are relatively easy (though the plant will not flower until it's at least a year or two old, and seedlings aren't quick growers). I tried rooting a cutting once, some time ago, and it didn't go anywhere, though that was before the mini-greenhouse. The wood is said to be used occasionally in woodcarvings or furniture, though this is not common because it's not economical: the plant just doesn't grow quickly enough. Murraya also has connections to some interesting culture: this site says that in Javanese culture, the plant is said to be capable of warding off witchcraft, bad luck, and the devil himself.2 The story I find more congenial is from the specific Javanese site of Jogjakarta Sultanate, where the king always stopped to think by a Murraya tree before entering the palace hall for a meeting, so that the plant became associated with wisdom and contemplation.3 'Cause, I mean, if you're looking for a way to banish devils and witchcraft, you could do a lot worse than taking some occasional quiet time to think about stuff. Molly Ringwald: from leavemethewhite.com; all others: my own. 1 The fruits are said not to be edible by people, but I doubt that means that they're toxic, just that they don't taste good. Incidentally, nothing I ran across suggested that any part of this plant is toxic to pets or children, which should be of interest to readers with one or both. 2 This has not been my experience, at least in the bad luck department: I have about as much bad luck now as I ever did. It does seem to be effective as a devil repellent, though: I have spotted no devils in nearly a year. It is also an effective thermonuclear bomb repellent, elephant repellent, and great-white-sharks-falling-from-the-sky repellent. It is less effective at warding off loss of employment and drunken college students, though in fairness, I don't think there's anything that can repel drunken college students. Related note: Our upstairs neighbors just came back from wherever they've been for the last few days, and started up a drunken party with bongo drums at about 10:15 PM last night. This would be less problematic if they had longer attention spans, or any kind of natural rhythm whatsoever, but instead the drums start and stop, get louder and softer, arrive on, just before, or just after the beats, and come in 90-second segments before morphing into some other pattern, so it's impossible to try to sleep through. We called the cops, because it sounded like there were several of them (guys, not drums -- we think there are only one or two drums) and they were drinking and yelling, and also because anybody who doesn't understand that bongo drums at 10:15 PM in an apartment building is a bad idea is probably not going to respond to reason anyway. To their credit, they stopped pretty immediately. I personally hope that they stopped immediately because they all spent the night in jail for underage drinking, but that's because I am a mean, mean fucker when I can't get to sleep when I want to sleep. 3 Well, wisdom, contemplation, and royalty, let's note. The Murraya is a silent, slow killer. Those flu symptoms that you have been experiencing are thanks to the innocent looking orange jasmine. Get rid of it NOW or face a lifetime of illness. Anonymous: your psychosis intrigues me. Please elaborate. My psychosis or the plant's??? In a nutshell, my children and I are allergic to the damn Murraya. I only discovered this after 3 years of unrelentless, chronic illness. To see one's children suffer the way they did, whilst experiencing the pain, is enough to drive any person to the brink of despair. Interesting plant. I tried to grow a Murraya koenigii, or rather I did grow it for a couple of years until I finally let the scale insects kill it. I wanted it so I'd have a source of fresh curry leaves for cooking, but they never had as much flavor as the store-bought ones. Murraya Paniculata is is my favourite plant for a decade ! 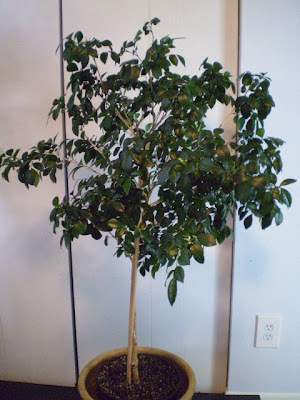 Believe me, I own many of these but one in particular is about 5 feet high and sits in a huge container and it's been in my house for nearly 8 years and thanx, no allergies. To force it to bloom, I bring it outdoor when danger of frost is gone. Every 30 minutes or so, I spray water over its leaves during the hottest part of summer days, on a regular basis for the first 2 to 3 weeks and occasionally after that period. Proper feeding helps too. One must care when feeding this plant, too much or improper food may produce excessive leaves or falling leaves and no blooming at all. My recipe consists of one level teaspoon of balanced 30-10-10 per liter of water every summer weeks. Be careful not to force it to bloom inside the house or prepare to open all possible windows. I once faced this problem, the fragrance of this plant may irritate when there're too many flowers at a time. That is why I now reduce watering when I bring the plant back indoor mid Fall and I stop feeding. No food till next Spring and watering only when the leaves curve a bit down, showing a lack of water. 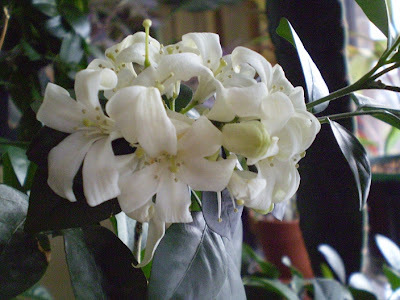 The plant will still bloom indoor but the rare flowers will gently perfume the house. Have all a great time gardening! Oh, but -- having it blooming inside is a lot of what I love about it. I'll grant that it's sometimes strong, but it's always been in a good way. And also I guess it doesn't normally bloom all over the whole plant at once, so maybe we've not gotten the full Murraya experience yet. I have two muraya in my home, one in the kitchen and one in my bedroom. Each about 5-6 weeks, It s like I was bite by insects, and it etches a lot, get big and goes right after 2 days. I thought it was small insect in my bed, but it is not. Would it be caused by my murayas that I smell often and am closely in contact ? Can somebody had this experience ? I couldn't say for sure, though I'd be surprised if it's the plant, given that you're experiencing this every 5-6 weeks. I mean, the plant is there all the time, right?